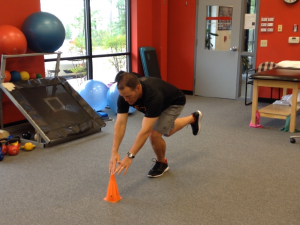 Increasing hip strength and stability is a common focus in training and injury prevention programs. Current research indicates hip and knee strengthening is more effective than knee strengthening alone in those suffering from anterior knee pain. 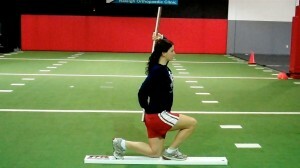 I routinely use mini-bands to strengthen the hips and maximize proximal stability. Many clients struggle with poor proximal hip stability that shows up as excessive frontal plane adduction and compensatory trunk lean. This exercise targets the hips and closed chain control needed for those participating in jumping, running, cutting and pivoting activities. It is an excellent way to warm-up and activate the hips as well as reduce patellofemoral overload and prevent knee injuries. This is the second installment of corrective “go-to” exercises I am highlighting here and in my online column for PFP magazine. Click here to read the post on resisted overhead squats. The in-line lunge allows for the observer to pick up flaws or asymmetry by placing the body in a narrow stance with a wide stride to assess hip, knee, ankle and foot mobility and stability of the client. It places the upper and lower extremities in alternate asymmetrical patterns. Limited mobility or hip disassociation will produce movement dysfunction with the in-line lunge (see picture below for how it is assessed during the FMS). A common corrective exercise prescribed to improve mobility is the leg lock bridge. Execution: Begin in supine flexing one leg up to the chest. Hold the flexed leg against the chest while keeping the extended (down) leg in line with the center of the body and the knee flexed. A small ball (pictured below), pillow or towel roll may be placed between the thigh and chest for tactile feedback regarding the lock position. Next, push down through the extended leg on the floor to elevate the hips off the ground into a bridge. The height of the bridge should be limited to the point where contact can be maintained between the thigh of the flexed hip and the chest keeping the extended hip/thigh in the in-line position. Perform 2-3 sets of 10-15 repetitions. Application: The ability to stride in a lunge position without forward trunk lean during the in-line lunge can be inhibited by tight hip flexors. Soft tissue work and stretching is certainly helpful, but this active mobility exercise will improve reciprocal movement and facilitate hip disassociation. It is a great exercise to include as part of your corrective exercise series and/or movement and pillar prep work with your clients. If clients struggle or experience hamstring cramping, consider adding a small step beneath the foot of the extended leg to increase the hip flexion starting position. Modifications and adjustments to sets, repetitions and distance between the flexed thigh and chest as well as the extended foot and ground should be considered with exercise prescription. While I treat a vast number of knee ailments in my practice, the focus of my training and rehab is often more proximally directed at the hip. 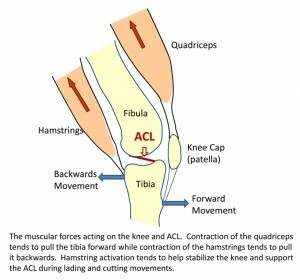 Understanding the role of hip muscles and how the hips and pelvis work together to impact knee alignment and closed chain function is critical in resolving knee pain and dysfunction. Below is a “go to exercise” exercise I use for gluteus medius activation and core/pelvic stability training. Using a mini-band provides an adduction force cueing the client to abduct and activate their external rotators to maintain proper alignment. Additionally, they need to avoid a drop on one side of the pelvis (look at the ASIS). Click here to read my entire column dedicated to this exercise in PFP’s online magazine. I hope you find this exercise and information useful for you and/or your clients.